Western blot analysis of extracts from various cell lines using Malic Enzyme 3 Antibody. 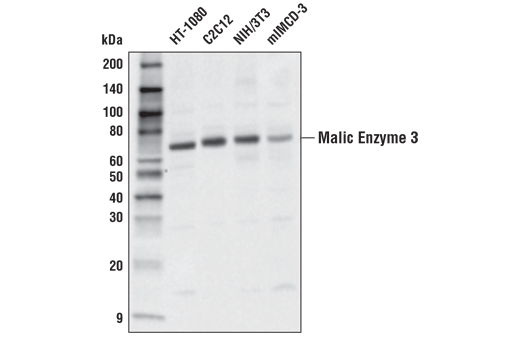 Malic Enzyme 3 Antibody recognizes endogenous levels of total malic enzyme 3 protein. This antibody does not cross-react with malic enzyme 1 and malic enzyme 2 proteins. Polyclonal antibodies are produced by immunizing animals with a synthetic peptide corresponding to residues surrounding Ala390 of human malic enzyme 3 protein. Antibodies are purified by protein A and peptide affinity chromatography. Malic enzymes catalyze oxidative decarboxylation of malate to pyruvate (1). The malic enzyme family in mammalian cells includes the cytosolic malic enzyme 1 (ME1) and two mitochondrial malic enzymes (ME2 and ME3) (1, 2). ME1 and ME2 are critical for tumor cell growth and their expression is repressed by tumor suppressor p53 (2). Reduced expression of ME1 and ME2 reciprocally increases the levels and activation of p53, promoting p53-mediated senescence (2). Research studies show ME3 is essential for the survival of pancreatic ductal adenocarcinoma following genomic deletion of ME2 (3). Deletion of ME3 is lethal to ME2-null cancer cells, which has been suggested to provide a potential therapeutic opportunity using collateral lethality (3, 4). Pongratz, R.L. et al. (2007) J Biol Chem 282, 200-7. Jiang, P. et al. (2013) Nature 493, 689-93. Dey, P. et al. (2017) Nature 542, 119-23. Muller, F.L. et al. (2015) Trends Cancer 1, 161-73.